With its wide open areas and relatively constant and predictable wind, Texas is a world leader in wind energy production. On March 26, 2014, the Electricity Reliability Council of Texas declared that Texas broke a wind energy production record at 8:48 pm. The wind turbines in the state generated 10,296 megawatts (MW) of electricity at that time, which was equal to about 29% of the 36,000 MW of total electricity produced at that time. The 10,296 MW of electricity produced at that time was also the most electricity produced by any United States wind power system to date, according to the American Wind Energy Association. Turbines along the Gulf Coast supplied 1,433 MW, or about 14% of the total amount of wind energy produced while turbines mostly located in West Texas provided the other 86%. West Texas is a major contender on the wind scene, especially since it is home to numerous Competitive Renewable Energy Zones that generate wind and directly integrate it into local grids. As of April 2014, there is about 11,000 MW of wind energy generators online and another 8,000 MW worth of generators scheduled to come online over the following months. From 2012 to 2013, wind power in Texas grew from 0.7% of the total grid’s energy to 9.9% of the grid’s total energy throughout the state. Wind is an excellent source of cheap electricity and ERCOT is looking to expand it as much as possible. As the nation’s leader of wind energy production, Texas is paving the way for how to develop and harness this powerful resource. Several regions of the country are following Texas’ example and continuing to develop wind power. Some of them are not far behind, either. The Midwest Independent System Operator which covers from North and South Dakota to Michigan and Indiana had a record wind output of 10,012 MW in 2012. Xcel Energy of Colorado met 60% of the grid demand at 1:00 am on May 24, 2013. If the current rate of expansion keeps up, we are sure to see more wind energy records in the years to come as well as a widespread infrastructure to support wind generated electricity. 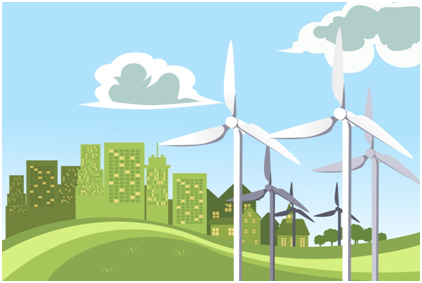 You can help contribute to the public demand for wind energy by harnessing your power to choose an energy provider and plan that offers renewable energy. Every voice that demands clean, renewable energy is another step toward a sustainable energy plan for the nation. This entry was posted in Cheap Electricity and tagged cheap electricity rates in Houston by dmirza. Bookmark the permalink. Copyright © 2019 Shop Houston Electricity. All Rights Reserved.